Gujarati Literature Festival is back again!!!! Gujarati Literature Festival in Ahmedabad is going to held at Kanoria Centre for Arts. Gujarati Literature Festival 2016 is for three days in Ahmedabad. Gujarati Literature Festival (GLF) is organizing Gujarati Literature Festival for last years and has achieved success in it. The third edition of the GLF is going to start on 8 January and ends on 10 January. Gujarati Literature Festival is a celebration of Gujarat’s literary of your mother tongue. It is stage for young generation to show talent or their creativity in the GLF. In GLF 2016 there will be 50 sessions with over 100 authors and experts participants. The registration for the Gujarat Literature Festival event is totally free. Gujarati Literature Festival 2016 Ahmedabad has brought specialist and creators of literature, art, music, drama, film and folk art for a live interaction of Gujarati Language. 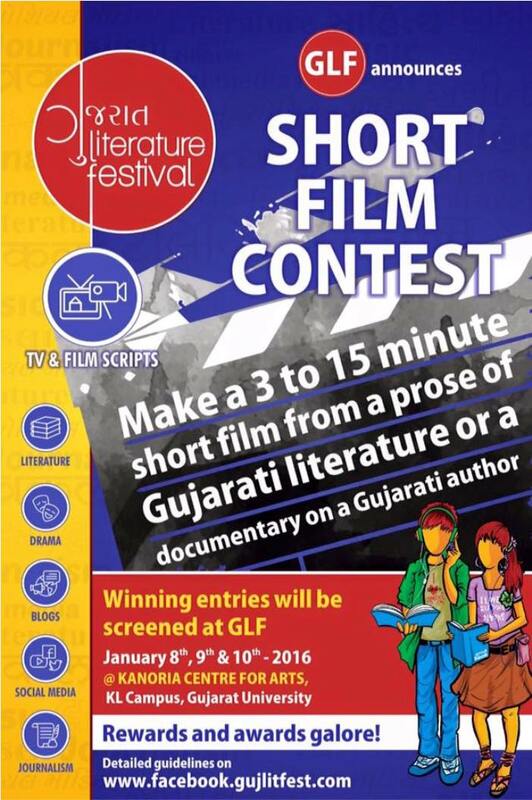 An exciting short film festival contest about Gujarati literature is going to happen in Ahmedabad. Youth generation should know importance of mother tongue in Guajarati Language. The Judge of GLF short film contest is Harsh Chhaya, Kaajal Oza Vaidya, Abhishek Jain, Aditi Desai and GLF core team member. In 3rd Edition of the Gujarat Literature Festival, more than 100 speakers in over 50 sessions along with workshops, literature quiz, TV & film scripts, drama, social media and journalism, short film contest, reading sessions, blogs, photography exhibition, stalls, food, interaction with writers and publishers and Master classes from experts. The winner of short film contest 2016 will get the award for the best creativity or talent. Get ready to participate in the short film competition at the Gujarat Literature Festival 2016 Ahmedabad at Kanoria Centre for Arts.